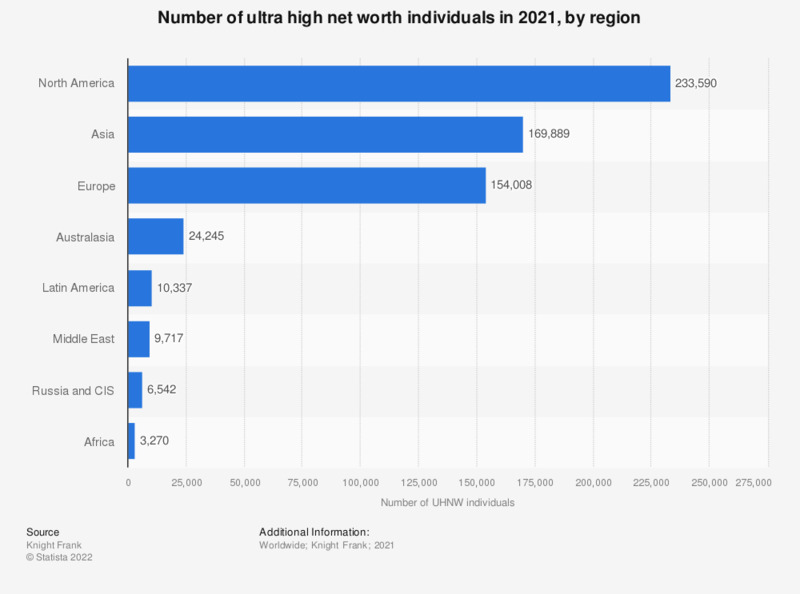 This statistic shows the regional distribution of ultra high net worth individuals in 2018. About 73,557 individuals with net assets of at least 50 million U.S. dollars were residing in North America in 2018. That is about 49.1 percent of the total number of UHNW individuals worldwide. Ultra high net worth individuals is a term used to describe individuals with net assets above 50 million U.S. dollars. Reliability of data is a major problem in this area of research, as not all billionaire families are willing to cooperate with researchers, and tax returns are often inadequate given the complexity of wealth ownership arrangements. For this reason most attention is given to net assets, as reported in the Forbes rich lists for example. Information on other assets including real estate or trophy assets such as expensive yachts are often not accessible. The same goes for personal debt. The top 1 percent alone holds around 47% percent of total global wealth. As shown in the above statistic, North America is still the top region for ultra high net worth individuals, with about 40,000 living in this region. In terms of single countries, the United States leads by far with about 70,540 UHNW residing there, which comes down to 49 percent of all UHNW worldwide. However, China has been propelled into second place with around 16,511 UHNW, mainly owing to its recent economic success.